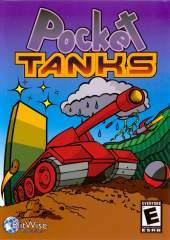 Pocket Tanks is based on the concept of the older game Scorched Earth that we all know, 2 tanks are placed in a random terrain and the battle begins with over 60 weapons and constant new weapon-packs and game updates by the author. You can decide if you'd like to play with wind, terrain types, explosion size and kick. You can play against the computer on 10 levels of difficulty, or against another friend in regular combat or target practice. The real challenge is to find a combination of angle and power that will hit the opponent's tank, wind making the task prove difficult, and adjust yourself to your opponent's attacks such as dirt-cover based attacks and other high-tech weapons messing with your aim. The special collector's edition of this game comes with the 14 weapon packs built-in, that were released up to date: The Fuzz Pack, Tornado Pack, Snowball Pack, Gold Pack, Gravity Pack, Fireworks Pack, Super Pack, Chaos Pack, Power Pack, Flamethrower Pack, Meteor Pack, Nuke Pack, Ambush Pack, and the new Nano Pack that was released a freeware pack special for the Collector's Edition release. All in all, 190 weapons.